Ariel Guzik – Holoturian. Edited by Nicola Triscott. Arctic Perspective Published by Arts Catalyst, 2017. Buy as print-on-demand paperback now, download as .pdf or read on Issuu. For the last 10 years, artist Ariel Guzik has searched for a way to communicate with whales and dolphins. Guzik’s project has encompassed the creation of underwater instruments, expeditions to contact whales and dolphins off the coasts of Baja California, Costa Rica and Scotland, and sound recordings of these remarkable encounters. Guzik’s Holoturian is a new underwater resonance instrument designed to communicate with whales and dolphins in the deep seas. 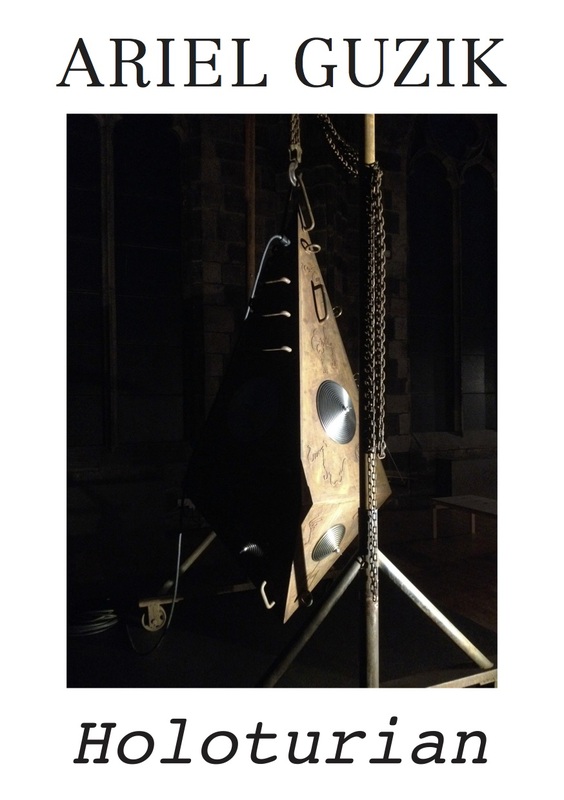 Commissioned by Arts Catalyst and Edinburgh Art Festival in 2015, it was was shown as an installation in the Edinburgh Art Festival, alongside objects, drawings and films from the artist’s research. The book explores the ideas underlying the Holoturian project, bringing together artistic, scientific and environmental reflections on Guzik’s work, the language and culture of cetaceans, and the challenges facing these intelligent creatures in our threatened oceans today. It comprises images of the research and installation with texts by curator Nicola Triscott and marine scientist and conservationist Mark Simmonds OBE. Ariel Guzik – Holoturian. Edited by Nicola Triscott. Designed by Margherita Huntley. ISBN 9780992777685. Print version: Paperback, £6.44 pages. 14.81 wide x 20.98 cm. Weight 0.11 kg. Black & white inside. Full colour cover. 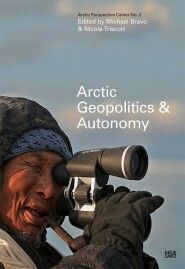 Arctic Geopolitics & Autonomy. Edited by Michael Bravo & Nicola Triscott. Arctic Perspective Initiative cahier no. 2. Published by Hatje Cantz Verlag and API, 2010. Buy online or download in pdf. This newly edited collection is the result of a collaboration between Nicola Triscott (The Arts Catalyst) and Dr Michael Bravo (Scott Polar Research Institute) with the artists Marko Peljhan and Matthew Biederman. As the dominant discourses of Arctic geopolitics are blind to the realities of life in the Arctic, its peoples and ecosystems are repeatedly trivialized in both geopolitics and the arts. The book explores how technologies have transformed relationships between environment and politics for Inuit and other northern peoples, and reflects on the interplay of visual culture, technology and indigenous activism. The key question seen from five distinct vantage points is to what extent we should look to experiments in technology to bring autonomy to the citizens of the Arctic. Together the essays – by Michael Bravo, Nicola Triscott, Katarina Soukup, David Turnbull and Lassi Heininen – reveal a new approach to the study of technology and mobility that may allow us to rethink Arctic geopolitics from the ground up. The book is part of a series published by Hatje Cantz Verlag and the Arctic Perspective Initiative. Brandon Ballengée. 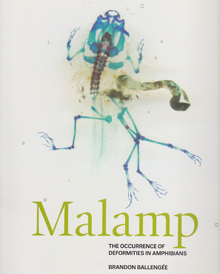 Malamp: The Occurrence of Deformities in Amphibians. Edited by Nicola Triscott & Miranda Pope. Published by The Arts Catalyst and Yorkshire Sculpture Park, 2010. Buy online. The environmental artist and ecological researcher Brandon Ballengée possibly comes closest to an idealised synthesis between art and science. His artistic practice is immersed in the study of biodiversity, ecological change and global species decline. In particular, Ballengée has been working on declining and abnormal development of amphibians as a way of visualising localised environmental degradation. His practice incorporates primary biological research and ecological surveys, working with members of the community and scientists, culminating in art works, exhibitions and published scientific research. This monograph brings together Ballengée ‘s UK research with findings from his global amphibian studies. It includes texts on his practice from arts, science and ecological perspectives, including a keynote essay by the renowned art critic and curator Lucy R Lippard. Additional contributors include Clare Lilley, Head Curator at Yorkshire Sculpture Park; Nicola Triscott, Director of The Arts Catalyst; Dr Stanley K Sessions, Professor of Biology, Hartwick College and Dr Kerry Kriger, Director of Save the Frogs. The publication is richly illustrated with extraordinary photographs, Ballengée’s drawings and other artworks. Zero Gravity: A Cultural User’s Guide. Edited by Nicola Triscott & Rob La Frenais. Published by The Arts Catalyst, 2005. Buy online. 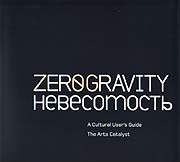 This title is a survey of The Arts Catalyst’s pioneering zero gravity projects carried out between 1999 and 2004. Beginning with a contextual overview, the book traces the development of the projects and the inauguration of the MIR (Microgravity Interdisciplinary Research) consortium which gives international artists the opportunity to carry out individual projects in zero gravity. It includes essays by Eduardo Kac, Marina Benjamin, Rob la Frenais, Kodwo Eshun and Judith Palmer, and explores artists’ projects by Kitsou Dubois, Otolith Group, Marcel.li Antunez Roca, Stefan Gec, Yuri Leiderman, Vadim Fishkin, Dragan Zivadinov, Andrew Kotting, Jem Finer and Ansuman Biswas, among others.